Get your geek on and show your support for some of our great North Avenue businesses, by joining in on the East Tosa/North Avenue Bar Crawl. 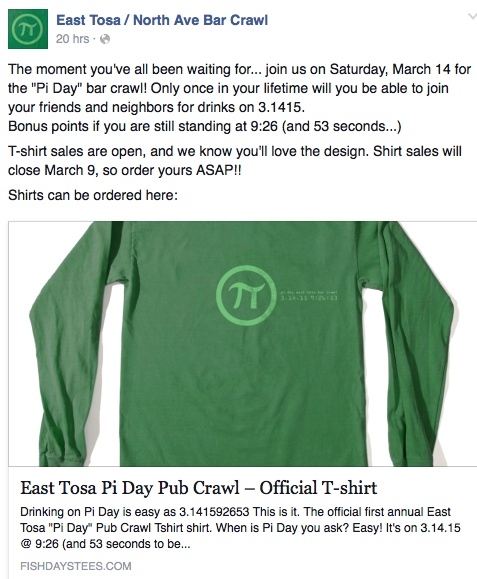 This Pi Themed bar crawl will be Saturday, March 14, 2015 or for the mathematically enamored, 3.1415! Participating establishments are Bel Air Cantina, Camp Bar, Cranky Al’s, Hue, Juniper 61, and Red Dot. Drink specials will only be offered to those in the fashionable official East Tosa Bar Crawl T-Shirt. T-shirts are available at Fish Days Tees, via this link. Feel free to join the fun even if you don’t order the tee, but why wouldn’t you! More details and the schedule should be on the East Tosa/North Ave Bar Crawl Facebook page soon.